The women had an friendly 11-a-side game on 26 August 2012, but continued with their Sunday games on a big covered pitch at Turf City on 2, 9, 16 and 23 September 2012. Hur Yuin had ACL surgery on Monday, and Jasmin informed me that Jasmin will be in charge of the women's game while she is out of action. The game today was cancelled. No game on 25 November 2012. Only one women's game in January 2013, in the first week - 6 January 2013 (8). As in the last two years, the women, mainly from the Law Society's women's team, are now training for the Bench & Bar Games in May, so they won't be having their regular game on Sunday evenings. I'll consider an all-comers' game if there is any interest. We haven't had an all-comers or mixed game since 2009. I've left several other more ad hoc ones under the GIFFA-Defined Games category. * Chen Hong's Shell v East Coast regulars on Thursday, 5 April 2012, at East Coast. * Hail's team v David T's team + Babs on Thursday, 26 April 2012, at Khalsa. * 9 June 2011, at Khalsa, put together by Kelvin Au. * 15 September 2011, at East Coast, put together by Kelvin Au. * 5 April 2012, at East Coast, put together by Chen Hong. The game on 5 April 2012 was not recorded for the Shell players. The game tonight (Thursday) at East Coast ended up as Glenn T's Shell (Special Chemicals) team against the rest. Most of Glenn's team were new to our games. Glenn T put the names of 6 colleagues down together with his, and then requested that they be on the same team, which effectively gave rise to an old-style team match. I'd rather such matches come about by the team looking for a match letting me know early. One of the Thursday slots (9 to 10 pm, either at East Coast or Khalsa) can be made available. I will then either not schedule that slot as usual, or, if already scheduled, take it out of the regular schedule. Those looking for the regular game can still put their name down for the other venue. The alternative would be at the weekend. I ordinarily will not make a regular slot available for a team match at the weekend, but I can check for the availability of an additional slot. As I have pointed out before, for team matches, I am not concerned about the players in the other team. If a GIFFA selection is playing, I am more concerned that the GIFFA selection is not weaker than the team they are to face. Just over a year ago, on 5 April 2012, we had Chen Hong's Shell team against East Coast regulars. Likewise, the game was not recorded for those on Glenn's team, apart from Glenn himself. In future, whether a potential team match is scheduled under OPSAGE or under GIFFA-Defined Games will turn on amongst other things (1) how it came about, (2) who proposes it, (3) which set of players it is intended to benefit, and (4) whether it was proposed more or less than 5 days before the game. The report thread will be under the same category. Since Babs first brought beers for post-game drinks for the Saturday game at The Grandstand a year ago, on 12 May 2012, he has been organizing/co-ordinating a beer sponsor for the Saturday games, and keeping track of the same. * There are the odd casual players who "freeload", ie, play once in a while, get a beer, but don't get round to taking a turn. * There are players who don't drink beer, or don't want a beer after the game. I wouldn't want to deter either of the above category of players from putting their name down for the Saturday game. At the same time, I wouldn't want those who take turns to bring beer to feel there are other players who regularly "freeload". A solution would be to have a Saturday Beer Club. Players who want to participate in the rounds of beer each week can put their names down below. They can then take turns, bringing enough beer for "members", and perhaps a few spare for friends or to tempt non-members to sign up. It also allows those who are injured or not playing to turn up to have a beer. Those interested, add your name below! Add your name in the same way you add your name for a game. Also, you have to take into account that not everyone plays everyone week. Apart from Rockstar, Fred was out injured for several weeks. And you and Brendan have been away on holiday at various times. It will have to boil down to how frequently each person has a turn, based on how often they turn up (whether to play or watch). You might need to take attendance separately for the beer club! With effect from this month, I will move posts concerning beer sponsors from the schedule thread to this post under OPSAGE, to be re-named again as "Post-Game Drinks". This will reduce the likelihood of the thread running into 2 pages, and hopefully, provide a more convenient way for Babs to manage his beer sponsors. I suppose Babs is sort of the founder. And he's been doing most of the monitoring and rostering. And you can call it anything you like - Babs' Beer Buds? ..., they won 7-0. I believe it was their first victory in a while. The regular Sunday games might have helped. Anyway, the women's Sunday game will resume next weekend. With the long weekend, the women's game resumed yesterday (Sunday), 6 to 7 pm, at The Grandstand, on a small pitch. No Sunday women's games on 2, 9, 16 and 23 June 2013 due to the school holidays. The Sunday women's game resumed today - with the usual 6 to 7 pm game on a big pitch at The Grandstand (3). * 7 July 2013, on a big pitch (6). * 14 July 2013, on a big pitch (9). * 21 July 2013, on a small pitch (-). * 4 August 2013, on a small pitch (-). * 25 August 2013, on a big pitch (12). * 1 September 2013, on a small pitch (-). * 29 September 2013, on a small pitch (-). Only one Sunday women's games in October 2013 - on 11 October 2013, on a big pitch (12). The women used the small pitch on 10 November 2013 and 15 December 2013. Gwen took over the uncovered 7-a-side pitch at the Rainforest Sports Hub on 29 December 2013 after our regular Sunday game (moved there due to the covered pitches at the Premier Pitch being closed for refurbishments) was cancelled. I have arranged for the women to handle their own bookings this year. To allow players to get to know each other better, even if they don't regularly play in the same games, I'm going to try a weekend WhatsApp group chat for anyone who is interested in chatting about the football on TV or other sporting action each weekend. I will put up a thread on the "OPSAGE" board each Wednesday for players to sign up for that weekend. I will start in the new year. 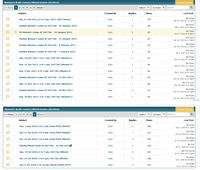 I put up a thread on the OPSAGE board for the weekend of 4/5 January 2014, but I didn't do anything to promote it, and with no posts and just 19 page views, it fell flat. I didn't put up a thread for the weekend of 11/12 January 2014. I've deleted the thread for 4/5 January 2014 and will put up a thread for 18/19 January 2014. It may take a while to get going. ..., as the "Women's & all-comers' game" thread has more page views (51 posts 819 page views) compared to the "OPSAGE" thread (25 posts, 588 page views), it makes more sense to merge the "OPSAGE thread" with this, "Women's & all-comers' game" thread (51 posts, 819 page views), and re-named it "OPSAGE, women's & all-comers' games". ..., everyone should see [an all-comers' game] as just an opportunity to have an extra game which will be more social and less competitive. I haven't really tried to get it going so far (that is, on each occasion, I didn't SMS anyone, which is what is needed to get a new game going). When I do try again, I'll probably try a little harder. Before I extended the concept to include family under the age of 18, I referred to the all-comers' games as "mixed games". * For players looking for a less intense game when they come back from injury. * An additional game for women players. .... It is also for stronger players looking for a less competitive game, or for any player who has female friends who want to play as well. For those who feel they do not meet the basic standard, I am always looking to start a more social game. &nbsp;These are addressed under the "OPSAGE, women's &amp; all-comers' games" announcement and developments thread. As GIFFA will be 5 years old in November 2014, an event to mark the occasion. An 11-a-side match. We had six 11-a-side games in 2008 and 2009, the last of which was in June 2009. We could have two elected team selectors choosing their teams from a pool of players, as we do for our regular games. GIFFA tops, in white, red and perhaps black. Previously, in 2009, under the old blog, Gilbert arranged FIOFAFI jerseys in white, red and black. As I am more protective of the "GIFFA" name, this time round, I will do it myself. I still haven't gotten round to promoting the Weekend WhatsApp Group chat, and it still hasn't gotten going. I will remove the date from the thread on the OPSAGE board, and just add a weekly reminder on that thread. If at least one of the above gets off the ground this year, I will be pleased. The prediction table will be maintained for the same periods of time as the team selector/captain table. At the end of a season, provided that there are at least 10 users who have made at least 5 predictions each, the highest placed player in the table who has at least 5 results included will win a prize. Apart from a player trying to predict the result of games in which he was playing (Rockstar, on 19 April 2014, and on 10 May 2014), so far, there have only been a couple of attempts by non-players to predict the result (Rockstar, on 26 April 2014, and Jeremiah, on 26 June 2014). It is currently more work than it is worth. I will abandon the prediction table for the rest of this GIFFA season (up to 30 September 2014). There were no special events in 2014 to mark GIFFA's 5th anniversary. Perhaps the 10th anniversary, in 2019. Or the 10th anniversary of the FIFFA blog in 2017. Jan organized an 11-a-side game last Monday on The Float. The pool of players consisted of about 90% Giffa players. We had the pitch from 7-9pm and played full 90min split into two 45min halfes with a referee. It was a great experience that i recommend for everybody with a chance to play on that site. Very memorable to play in the middle of the financial district on a full size pitch. And it was tremendous value at sgd 28 each. It is always open to anyone to try to organize an 11-a-side game on this forum. As I have stated before, I am currently not keen on being involved in organizing 11-a-side games. First, the bulk of our participants are primarily interested in 5, 6, 7 or 8-a-side games. Secondly, organizing a one-off 11-a-side game takes too much effort. However, I’m happy to lend whatever support I can to anyone using the forum to organize an 11-a-side match. It was previously one paragraph, which I have divided into three. I have also changed the header from "OPSAGE" to "General". Extra indoor football games at times other than those routinely scheduled, such as at 10 to 11 pm on weeknights, Friday nights, or Saturday or Sunday mornings. Ad hoc representative games against other teams, whether 5, 6, 7, 8 or 11-a-side. Other team sports such as Cage cricket, floorball or Ultimate. Picking up opponents for a racket game or other individual sport, such as tennis, squash or badminton. Other groups looking for additional players for their regular or ad hoc games. Other teams seeking players for their side. Arranging a match between two teams. Arranging to go watch local football, such as S. League matches, or other sports and events. Arranging other social activity, such as drinks. The person proposing the OPSAGE should ordinarily take the lead in organizing it. The person proposing, organizing, offering or sharing information about any OPSAGE should include relevant details. The manner in which the OPSAGE is held shouldn’t be inconsistent with FIOFAFI’s core values. After somewhat of a hiatus, Babsy's Saturday Beer Buds is back in business. When one of Kelvin Neo's friends pulled out of the game at SBSA on Tuesday, 24 March 2015, he said he had a female friend who could replace him. Better not, some of the other guys are sensitive about female players. I tried having mixed games before, not popular. The guys feel they can't play their normal game. If there is enough interest, I am keen to have mixed games. But need enough interest, from both male players and female players. I have tried before, maybe in the future I'll try again. I now refer to "mixed" games as "all-comers games", as age restrictions and basic standard requirements are also reduced or removed. Kelvin: Haha alright. She trains with the national team btw. But got some injury so became less competitive. Me: I know there are some good female players. I will try an all-comers game again at some stage in the future. Team Matches Archive. The threads on this sub-board were within one page (see first image below). Women's & All-Comers/Mixed Games Archive. The threads on this sub-board were on 6 pages (see second image below, showing first and last pages). As there is no longer any reason to keep them as sub-boards, I have moved all the threads from the two sub-boards into the main board, and deleted the sub-boards. With withdrawals, we were short for even a 5-a-side for the game at Khalsa on Thursday, 8 December 2016. Ziliang got a female friend to make up the numbers. Continuing from the post above, an All-Comers/Mixed Game remains an important objective. I spend too much time trying to stabilise the regular games, but we are getting there. We also had a "team match" on Sunday, 27 November 2016, between a GIFFA team and Hamadi's team, in lieu of our regular Sunday game, which was struggling at the time, and is just about recovering.